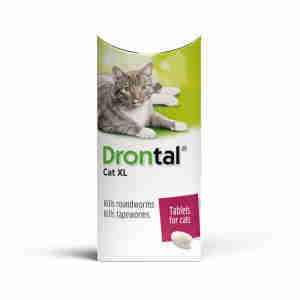 Drontal XL Worming Tablets treat and protect your cat from common worms in the UK. The XL tablets are suitable for cats that weigh over 6kg. Your cat should be treated with Drontal every 3 months to prevent them from developing worms. This single use treatment is given directly to your cat (either with their food or on its own) and starvation isn’t necessary. Fleas are often infected with the larvae of a tapeworm, which can be transferred to your cat if they swallow the flea while grooming. An Advantage 80 spot-on treatment is the easiest way to protect your cat but you may also need one that kills flea larvae in your pet's surroundings to effectively break the flea lifecycle. Each tablet contains 30 mg Praziquantel, 345 mg Pyrantel Embonate, 2.6mg of Titanium Dioxide (E171). Administer at the first sign of worms and/or every 3 months to keep your cat protected all year round. Works well for my big boy cat!